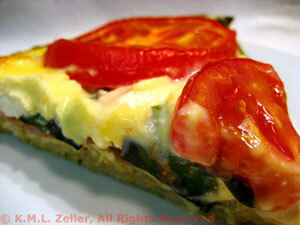 Thyme for Cooking Sunday Supper: Tomato and Goat Cheese Tart. If you don't have quick-cooking brown rice (it cooks in 10 - 15 minutes) you might want to cook it ahead of time. It needs to be a bit cool, anyway, and it makes the assembly very fast. You can use any type of beans you like for the salad - but I think this is the prettiest (and tastiest) combination. I use a brown rice crust for this; it's healthier. But you could certainly use a proper pastry or pie crust if you prefer. Instead of Prosciutto you could substitute a bit of regular, baked ham or smoked turkey. 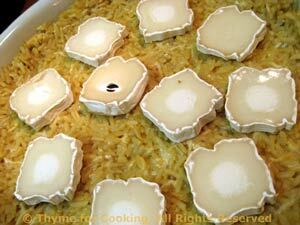 And any cheese would work, just don't use too much.... Use the aged goat cheese that comes with a thin edible rind. Pat into the quiche plate or pie pan, working it up the sides as best you can. Bake in 400F (200C) oven for 5 minutes. Slice goat cheese into 1/4" (.6cm) rounds. Slice tomatoes about 3/8 " thick, (.3cm). Tear or cut Prosciutto into large pieces. Whisk eggs and yogurt together. Arrange sliced goat cheese on crust. 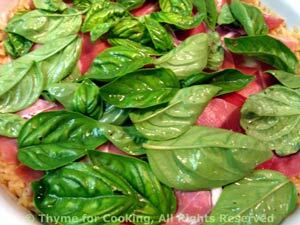 Top with Prosciutto and basil leaves. Pour egg mixture over as evenly as you can. Top with tomatoes; do not overlap. Bake for 30 minutes, until center has set. Note: When baking quiches or tarts, I put the dish on a sturdy baking tray, before pouring in the egg mixture, for easier handling. Strangely, this is a salad that I didn't like as a child. It was something I needed to put my own twist on, choose the beans and make the vinaigrette. Use any beans you like; these are my preferences for a pretty and flavorful salad. Top and tail beans. Cut in 1" (2.5 cm) lengths. Add beans and blanch for 4 minutes, until just tender. 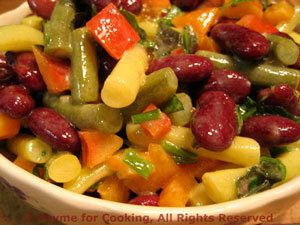 Drain kidney beans and add to bowl. Chop red pepper and add. In small bowl whisk together the sugar, mustard and vinegar. Slowly add the oil whisking constantly. Pour over beans and toss to combine. Set aside for at least 15 minutes. Serve. This keeps for several days in the fridge.